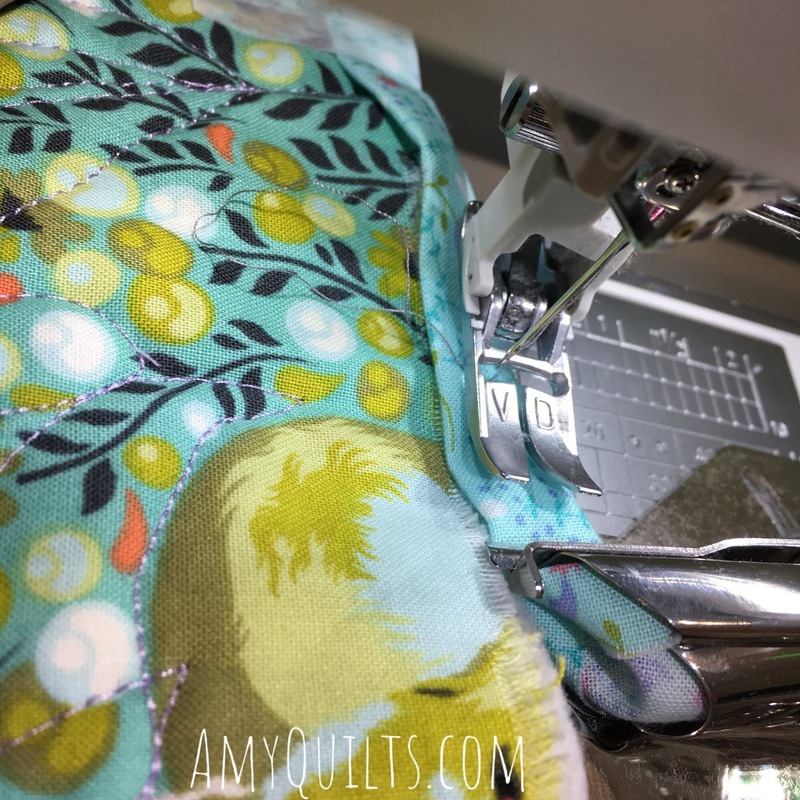 I love to free motion quilt my quilts, but once I get done quilting them, especially if I've gone a little over the top with ruler work and dense fills, I tend to stall out on the binding. 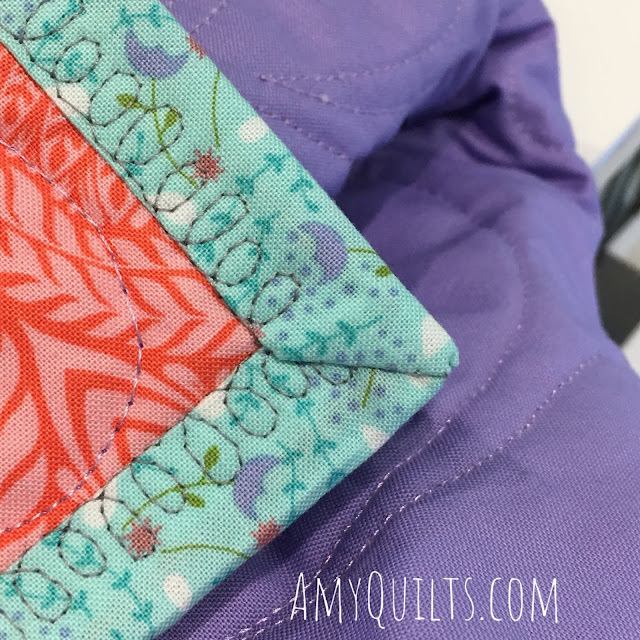 So I finally got around to using the Janome Quilt Binder Set. I am totally in love with the quilt binder set! It's perfect for just getting these quilts bound and done. And I'm a big fan of done over perfection any day. Four fabulous corners and #2 is where I joined the beginning and end! 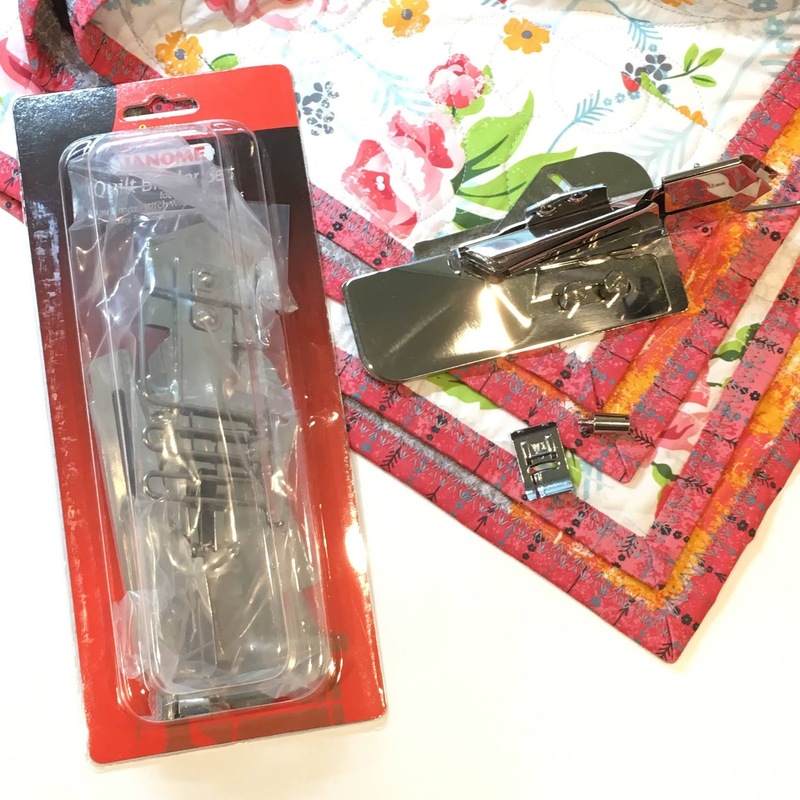 This is the Janome Quilt Binding Set, not to be confused with the simple binding foot, which can't handle the thickness of a quilt but does a great job with binding raw edges of garments or making thin straps. If you have something other than a Janome, check with your dealer as I would think some of the other brands would have a similar product. It attaches to the machine, in part, by replacing the bobbin cover door with the base of the binder set, so it's important to get the right one for your machine. It's only meant for the bigger machines as you've got to have some room to work. It does a half inch binding using a 2 inch strip of fabric. There are other binders that are compatible that do different sizes, but you need the base from this set to make them work with means another purchase, which can get spendy. So just stick with this one unless you've got your own sweat shop going. I cut my strips 2 inches wide and join them with 45 degree seams, then press to one side. I've tried to press them open but the binder just pushes them to the right as it is fed through, so to one side they go. I also make sure to load it with the seam allowances going to the right. As you can see in the above picture, the attachment wraps the binding around the edges. That 90 degree positioning/fold of the binding really helps get the quilt fully into the binding. There are several adjustments that the various screws allow you to make, including angling it for a curved edge and making the bottom fold stick out further than the top fold of the binding. 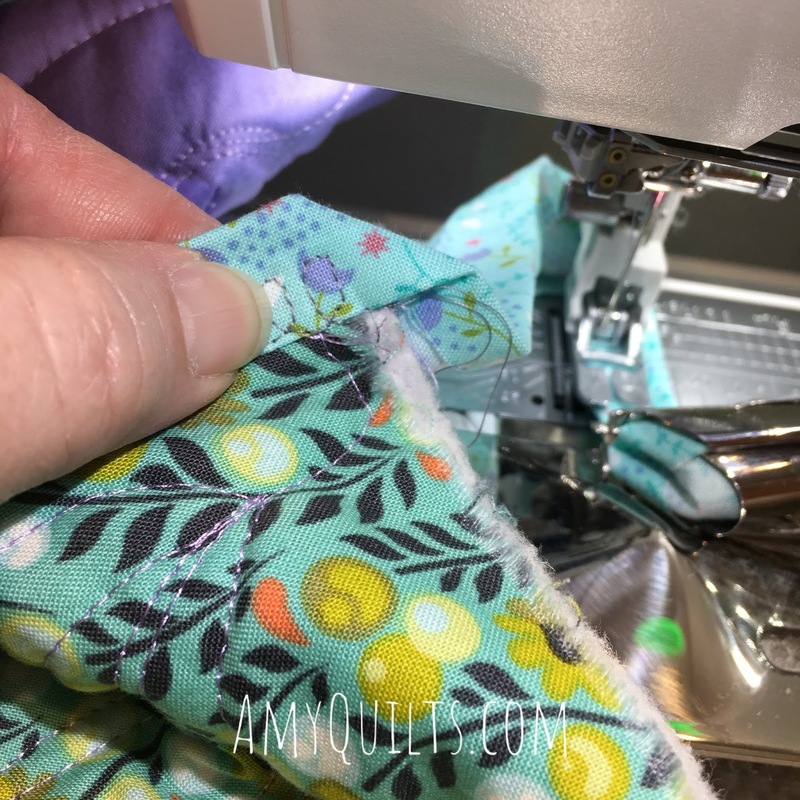 It comes with a foot but I chose to use my narrow Acufeed Flex Foot (a built in walking foot that is perfectly synchronized to the regular feed dogs) for more even feeding of the quilt layers and binding. It works fabulously together. 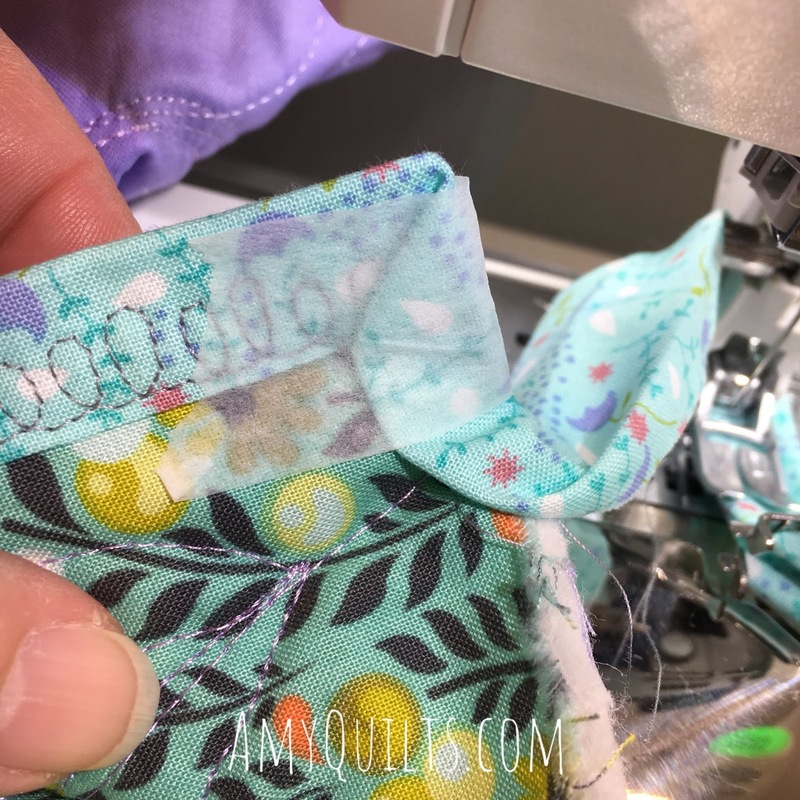 You can use a straight stitch but using a decorative stitch ensures that you'll catch both edges of the binding for sure. In these two samples, I used pretty wide stitches because they looked great with the quilts, but I have used a narrow serpentine stitch, blanket stitch, and straight stitch with great results. When you get to a corner, you stitch right up to the edge. 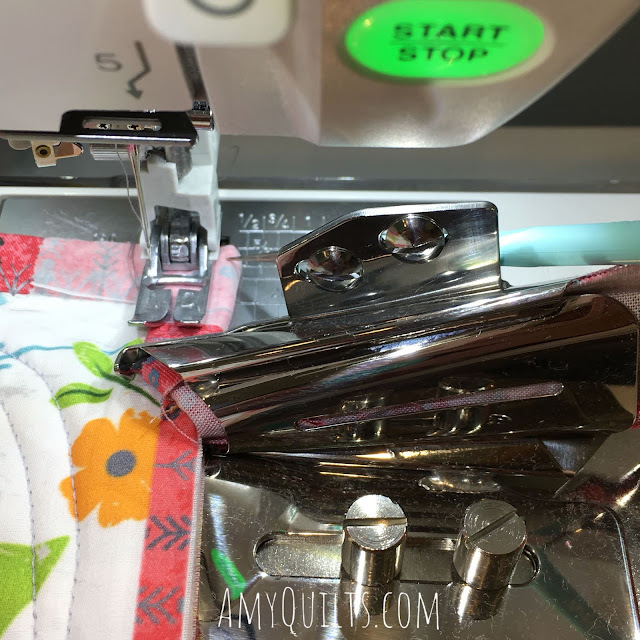 Then you lift the foot and pull the quilt straight back about 10-12 inches (away from you) and put the foot back down on top of the binding and finger press the folded binding hanging out the back of the machine. Don't skimp on how much you pull through the back or you won't have enough to comfortably work with. Then you fold the mitered corner down in front and secure with pins or tape, then the same for the back. I now prefer Kimberbell Tape to do this. I do not sew over pins and when using them, as soon as I took them out, it would shift. 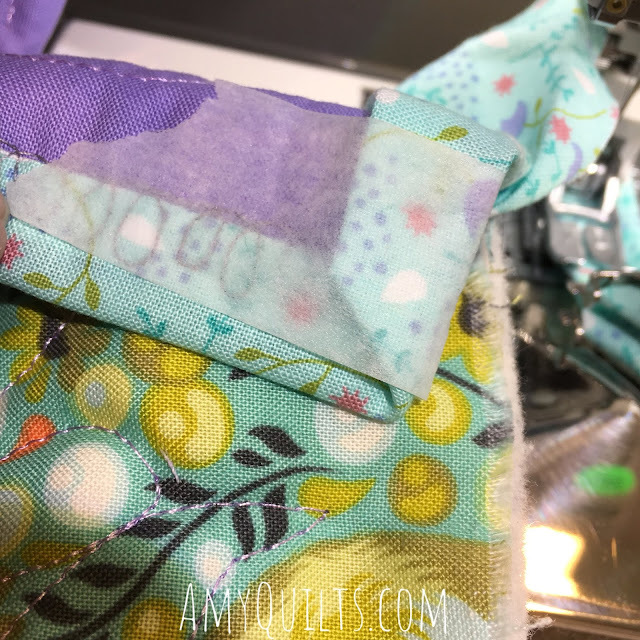 I can sew right through the tape and it picks out easily without gumming up my needle or fabric. Then you pull the quilt towards the back and insert into the extra binding that was pulled out. 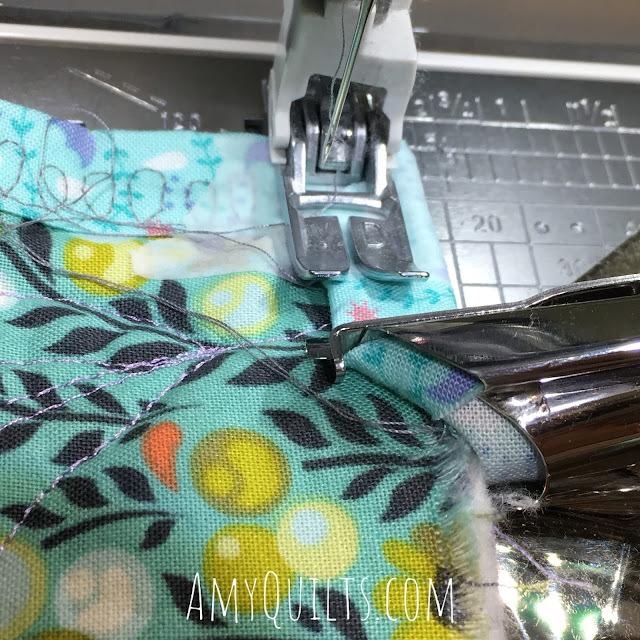 Then you carefully pull the binding backwards through the binder attachment, moving the quilt backwards as you go, until you are at the corner ready to continue stitching. Since I use the Kimberbell tape, I don't have to futz with pins. Just start stitching again. For the record, I wouldn't use any other brand of tape for this even it it does look like paper bandage tape. It's been made for stitching through. And how do I join the ends of binding? There are a couple of different methods, but I am now a fan of joining the ends at a corner! This means I can use the binder as much as possible. If I joined along a side, I'd have to wing it to secure the binding on either end of the join. So I just hand tuck the raw ends to make a nice mitered corner and stitch it down. If I stitch all four corners down at the miters, it would be super duper hard to tell the difference. 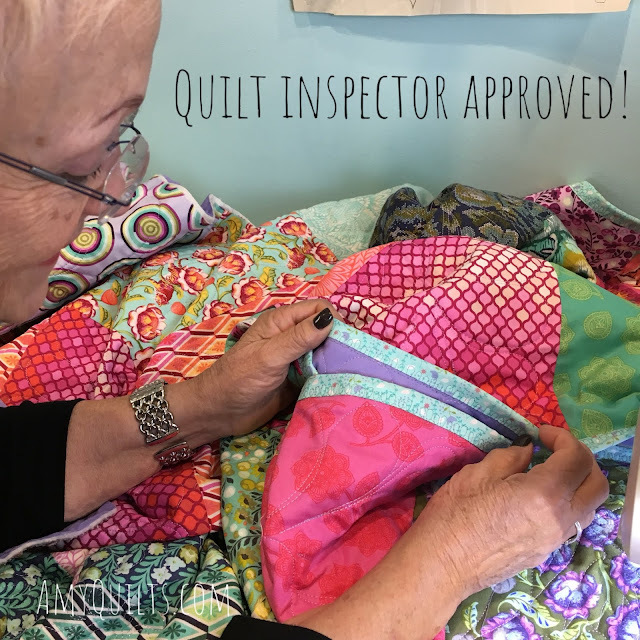 My friend and one of my favorite customers, Ann, took a look at this quilt and totally approved. 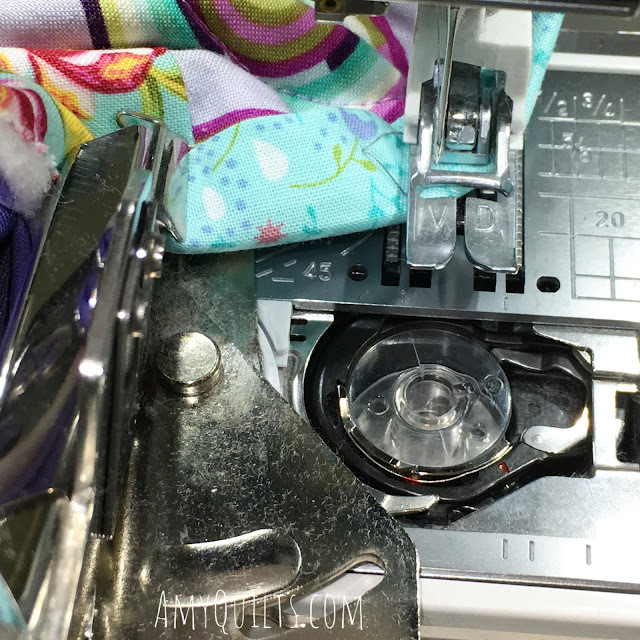 Because the attachment covers the bobbin cover door, you'll want to start with a full bobbin. Learn from my experience! Also, I don't recommend using a super complicated decorative stitch for this reason; uses more thread. 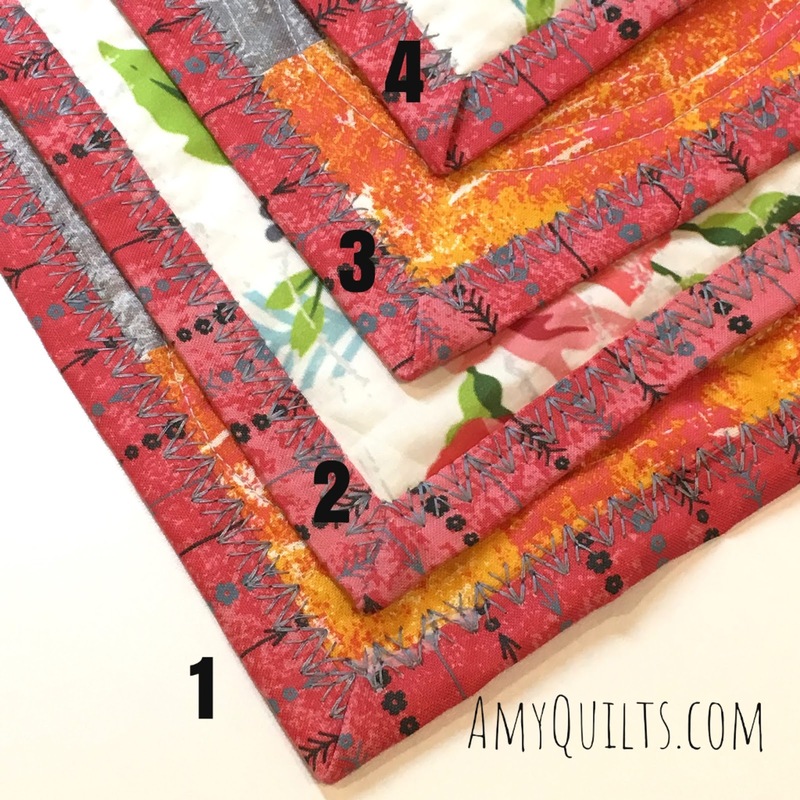 I wouldn't use this for show quilts, but if you want something to help get quilt binding done, this is fabulous. Great for charity quilts, utility quilts, and in my case, shop samples. I know some will say they prefer to hand bind, that's it's relaxing. I actually agree, but I am strapped for time and this helps. 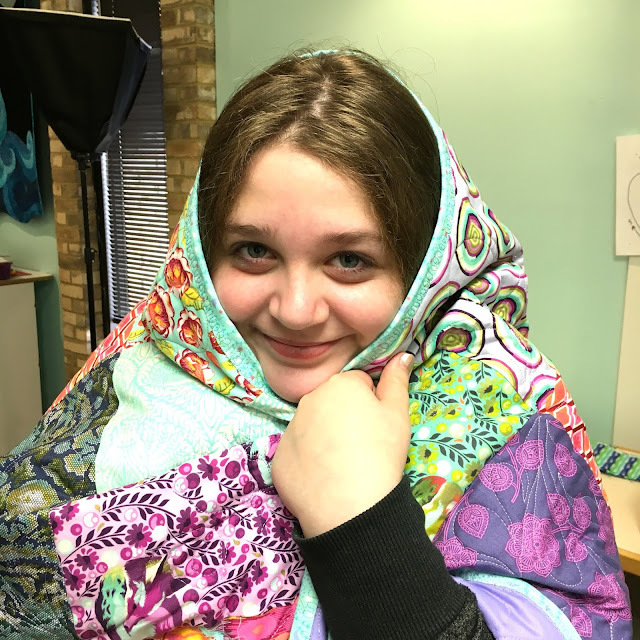 My daughter is certainly happy to finally have her first quilt done. She pieced these 10" squares together and then we split the quilting. We each quilted every other block, and then it sat....waiting for its binding. Now it's all done! Now, it's not cheap. But time is priceless. Many dealers don't keep the binders in stock because of the price, but I do, now that I've seen how easy it is to use. You can find the Janome Quilt Binder Set over at AmyQuilts.com in two versions for different machines. Finally, yes, I'm back to blogging here. Turns out our online shop's blogging platform makes it difficult to format a decent article and more importantly, it didn't allow me to respond directly to comments! That's a total deal breaker, so this will become the blog for all of my sewing and quilting adventures.